Pelenna Patchworks: Glow in the Dark patchwork fabrics from Timeless Treasures now available! Glow in the Dark patchwork fabrics from Timeless Treasures now available! We don't often get fabrics in for Halloween, but I couldn't resist these! 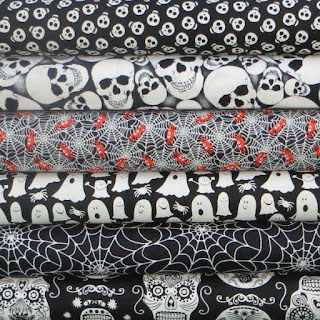 The Glow in the Dark fabric range from Timeless Treasures does what it says on the tin, all the white on the fabrics glows after the lights go out, making them brilliant for costumes and Halloween decorations (the stash pack or fat quarter pack would be great for bunting)!